BAYTOWN  As an increasing number of recent college graduates struggle to find jobs, national media outlets are asking the question: What role does education play in our economic recovery? On Tuesday, May 17 Lee College representatives were given the opportunity to answer that question when CNN correspondent Melissa Morgenweck visited the Baytown campus. The visit marked the culmination of CNNs week-long series spotlighting education and employment in America, and was prompted by reports of the Lee Colleges successful industry partnerships as well as post-graduation employment rates among the colleges Process Technology students. Established in part through donations and grants, the ExxonMobil Process Technology Program at Lee College seeks to prepare students for careers as process technicians, operators, research technicians and laboratory technicians in petrochemical facilities. The Baytown-Houston area is home to 600 large chemical complexes, many of which will face severe shortages in skilled technicians once the baby boomer generation begins to retire. Process Technology instructor Gail Disspayne, and Lee College President Michael Murphy spoke to Morgenweck about the ways in which the Process Technology Program is trying to meet this demand, as well as the importance of technical education programs. We will struggle as an economy if we dont find a way to fill these positions, Dr. Murphy said. When asked about their experiences in the Process Technology Program, students Tyler Slovacek, Nathan George, and Laura McCafferty said they felt fortunate. My brother graduated a year ago as a computer engineer with a four-year degree, and I graduated last year with a two-year degree and Im going to make the same amount of money he makes this year, said McCafferty. To view CNNs broadcast, visit: http://amfix.blogs.cnn.com/2011/05/20/where-are-the-jobs-look-to-baytown-texas/. Lee College in Baytown, Texas, serves a geographic area of more than 280,000 residents that includes the Goose Creek, Anahuac, Barbers Hill, East Chambers, Hardin, Huffman, Hull-Daisetta, and Liberty Independent School Districts. To learn more about Lee College, visit www.lee.edu. AUSTIN – On May 9, the Texas Education Agency announced the allotment of the $830,820,460 in Federal Education Jobs Funds that the State received from the federal government after Congressman Lloyd Doggett’s barring amendment was stripped from the budget last month. Crosby ISD has spend many hours trimming their budget by not spending on buses, new technology, cutting drastically back on cell phones, doing away with the tax office, terminating all not highly qualified educators, and ending the local Alternative Placement Education. Some 8 total educators will not be back next year at Crosby ISD and even more staff. After Crosby ISD did this adroit job of trimming the fat then we learn that some extra money for keeping teachers could be on the way if appllied for in the right manner. The school districts wholly or partially located in House District 127 (Rep. Dan Hubertys District) are receiving a total of $21,175,038 of the funds. Freshman State Representative Dan Huberty, R., District 127, has been appointed to the Education Committee and the State Affairs Committee in Austin. 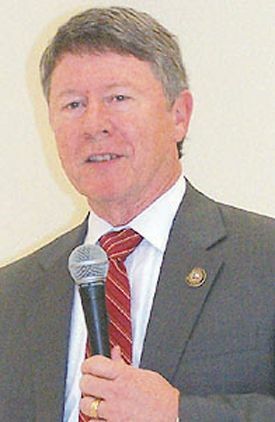 CROSBY Harris County Judge Ed Emmett addressed the Crosby/Huffman Chamber of Commerce on county problems and projections. It was not the usual talking points with the same old promises as made for the last 20 years. This time someone with an understanding of how the logistics of the county actually get dysfunctional made a suggestion on how the county can save money. Here locally the county has problems that are going to start eating our lunch. The criminal justice system, right now the jails are overcrowded, we are sending prisoners to Louisiana and other counties. We have to get some of those people out of our jails. The first people we need to get out of our jails have mental health issues. They are our frequent flyers, we see them over and over. When I became County Judge I thought I was going to be a transportation guy, now I am much more of a mental health guy. We have got to address the mental health of our county. The largest mental health facility in the State of Texas is the Harris County Jail. On any given night, there are more people there receiving psychotropic medications than any other facility in Texas. That is fundamentally wrong, I dont care if you are a Republican or Democrat it is wrong. Yes, they have committed crimes but we take them in for the term of their sentence and set them loose and say Have a nice life. What we want to do is take them at the appropriated number of hours before they are released and take them to a reintegration center and introduce them to good flight M.H.M.R.A. or Systems of Hope or anybody else who can provide services. M.H.M.R.A. can provide mental health services for about $30 a day in the jail we spend about $300 to $500 a day. When I hear someone say, We dont have the money build a new reintegration center, I say we dont have the money not to build one. We cant keep doing what weve been doing. said Emmett. Emmett took on the issues of statewide financing and school education next. Emmett had been in the Texas House 1979 until 87. He chairman on the Energy Committee and Transportation Committee. In 1989 President George H. W. Bush nominated him to the Interstate Commerce Commission, he was confirmed and served for three years. AUSTIN  Gov. Rick Perry has reappointed Douglas Walker of Beach City to the Coastal Water Authority Board of Directors for terms to expire April 1, 2013. The board oversees the authoritys provision of untreated surface water to the cities of Houston, Baytown and Deer Park. Walker is retired director of the ExxonMobil Chemical Companys Singapore Chemical Manufacturing Plant. He is treasurer and past chair of the Lee College Foundation Board of Directors and chair of the Bay Area Rehabilitation Center Board of Directors. He is also past president of the Rotary Club of Baytown, past assistant governor of Rotary District 5890, a past member of the American Institute of Chemical Engineers and past board member of the Baytown Chamber of Commerce and Baytown YMCA. Walker received a bachelors degree from Bucknell University and a masters degree in chemical engineering from Cornell University. Also reaapointed was Zebulun Nash of Houston. 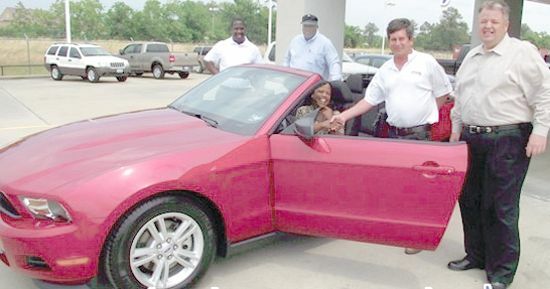 CHAMBERS COUNTY It is now time to Pay It Forward. Chambers County is raising funds to help the victims of the recent deadly tornados that ravaged Mississippi, Alabama and Illinois. County Officials have talked with Officials in Monroe County Mississippi where in the small town of Smithville almost every building was destroyed and 19 people lost their lives. The county asks that you donate to this worthy cause. Funds will be given to Community Bank For Smithville Relief Fund to help Monroe County, Mississippi. The county has set a goal of Paying It Forward of $33,000; Doubling It Forward of $66,000 or Tripling It Forward of $99,000 by August 1, 2011. On September 13, 2008 Hurricane Ike cut a path of destruction through Chambers County. In the aftermath of the worst disaster ever seen in our community we felt the kindness and selfless acts of individuals, organizations and corporations from across the United States. Chambers County employees thank Jackson County, Ms. for their $33,000 contribution. Jackson County, Ms. had received help from Jackson County, Mn. in the aftermath of Hurricane Katrina and had chosen to Pay It Forward to Chambers County. For more information contact: Chambers County Judge Sylvias Office at 409/267-2440 or mail to: Chambers County Long Term Recovery Organization ~ P. O. Box 410 – Hankamer, TX 77560. Donations may also be made at East Chambers County Bank, Anahuac National Bank or Barbers Hill Bank. MONT BELVIEU Barbers Hill ISD voters on Saturday overwhelmingly approved a $75 million bond referendum consisting of two propositions  one for $65.2 million and the second for $9.8 million. Proposition One which will pay for three elementary school buildings and their furnishings, passed with a 79% approval rate, while Proposition Two which will pay for an internal campus road, classroom additions for various fine arts programs and improvements to athletic facilities, was approved by 78% of the voters. There were 1,109 total votes cast in the May 14th election. Yes votes, with 675 coming in early voting. There were 234 No votes cast. The school district won the issue in all three polling locations: Mont Belvieu, Cove and Beach City. Proposition 2 received 853 Yes votes and 244 No votes. 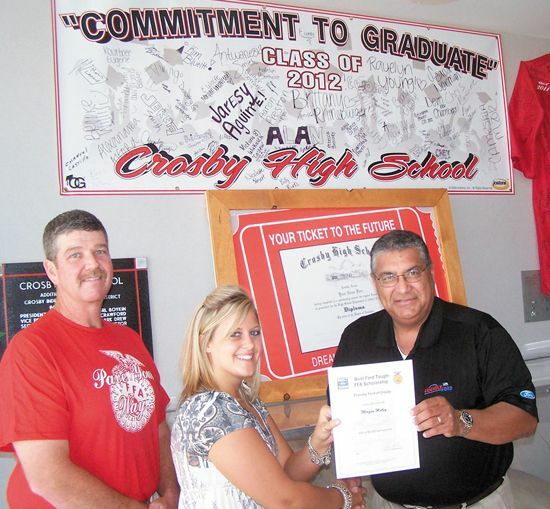 CROSBYA local senior recently won the Built Ford Tough- FFA Scholarship Program by Friendly Ford of Crosby. Morgan Motley says she was recruited by Tiffany Rooks to attend St. Phillips College in San Antonio, Texas and major in Agriculture Education. She plans to present a steer, pig, goat and a showbox for Agricultureal Mechanics at the Crosby Fair and Rodeo Livestock Auction to occur on June 8. Motleys parents are James and Wendy Motley of Crosby. The Built Ford Tough- FFA Scholarship Program is designed to recognize FFA members talents and accomplish-ments while encouraging their future academic achievements. According to Dale Chennault, Crosbys F.F.A. advisor, Motley has been in F.F.A. all 4 years at Crosby High participating in F.F.A. projects. The scholarship is one of 526 scholarships awarded by ford Division, Ford Motor Company and Ford Dealers to FFA members who are high school seniors planning to attend college in the fall of 2011, or current collegiate students. The program is part of Fords overall commitment to the National FFA Foundation. Additionally, five National $1,000 BFT-FFA Scholarships are being awarded on behalf of Ford Trucks as a special project of the National FFA Foundation. Ford has supported the National FFA Foundation since the first F-Series truck was introduced in 1948 and has sponsored the Built Ford Tough collegisate scholarship program since 1997. To date, the program has awarded $6,586,000 in scholarships to 6,586 Ffa members throughout the country. HIGHLANDS  A meeting attended by 45 surrounding areas residents at the Highlands Community Center had representatives of the Environmental Protection Agency (E.P.A. ), Texas Dept. of State Health Services, Agency for Toxic Substances and Disease, Harris County Health Department, Congressman Gene Greens Office and Texas Commission on Environmental Quality (TCEQ) to continued the dialogue with the surrounding community concerning the San Jacinto River Waste Pits Superfund Site. The Public Health Assessment reported on the removal efforts of sediment from three Waste Pits on about 20 acres of land situated on the West bank of the San Jacinto River just North of the I-10 Bridge contaminated with polychlorinated dibenzodioxins and dibenzofurans. This substance is largely from paper bleaching agents dumped at the site. Land has subsided since a paper mill began pouring waste there between 1964 and 1973 (mostly 1965 and 1966) such that two of the pits are now below water. The location had been a popular fishing location and the highest level of cancer causing agents are found in blue catfish and crabs near the location followed shortly by Hybird Striped Bass then Spotted Seatrout. Any fish from these pits are likely to have 2.04 pg/g. It might strongly be suggested not to eat fish or crabs from near these locations and avoid wading near these Federal Superfund pits. Sand was once mined from northwest of these locations, according to the University of Houston in a Dioxin TMDL Project Report. Where the sand went is unknown. Levels of concentration of dioxins in the mined sand is also unknown. Sand from the contaminated pits has washed downstream during heavy rains and runoff. Depart. of Health and Human Services evaluated 7 on-site samples and 4 off-site samples from samples collected by the TCEQ. According to E.P.A.s Stephen Tzhone contamination of collected samples appeared diminished substantially the farther from the sites on the river. The contamination seems to be tied to sediment in the general area. Oral contact with sediments, having the sediment on your skin and eating fish or crabs containing higher levels of dioxins and furans are the likely ways to be exposed to the apparent cancer causing agents. It was determined that exposure from airborne dust is unlikely, groundwater exposure is unlikely and surface water injestion is less likely. Children, subsistence fishermen and sporadic fishermen over years near the location were most likely to be effected negatively by exposure. Specifically the sites that had the highest measured contamination was at the sand pits (15,594 pg/g,) near the sand pits (82.24) then the Houston Ship Channel above and West of the San Jacinto River(65.69.) Next the contamination was Up-Stream and tributaries (15.97) and downstream from the pits (13.75.) Of all locations sampled off site only 40.04 pg/g were measured. It is suggested that 100 pg/g per year is dangerous and increases the risk for cancer. Tom Hill of Tug Boat Marina asked some pointed questions concerning the contaminations. His questioned groundwater contamination, economic loss for businesses from contamination, how far North of I-10 has been contaminated and what effect Hurricane Ike had on spreading contamination. After those questions he addressed is the site being stabilized or is the contamination being removed. Then he asked what are the reparations or cost recovery for businesses effected by the contamination. Hill asked the study makers to come out and test the ground water of nearby houses to give assurance of the drinking water being free from contamination. Hill was kind enough to point out that the representatives are there to fix the problems and did not cause the problems. The data to completely say how effected by toxins the farther away areas are has yet to completely be concluded but samples show less concentration in areas away from the pits. Dioxin levels within a half mile radius of the pits show low levels, so levels they are not considered different from most other locations. A new location has been identified as possibly contaminated over South of the Superfund Pits on the other side of the I-10 Bridge on a longer strip currently near existing businesses and houses. Concurrently with the Remedial Investigation, a Time Critical Removal Action is implemented to stabilize the source of the Site contamination. Currently about 40,330 tones of the sediment has been placed as of May 10, 2011. The average placement of the toxins is about 750 tones per day. This placement is about 65% complete and on target to meet the E.P.A. schedule. The E.P.A. is accepting comments on this site until May 31, 2011. For more information on the Public Health Assessment visit on-line www. dshs.state.tx.us.epitox.posted or one can visit the Stratford Library at 509 Stratford in Highlands. 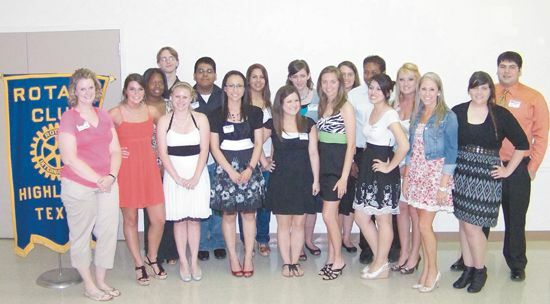 HIGHLANDS The Rotary Club held their annual scholarship banquet last Monday night at the Community Center, and awarded 18 scholarships totalling $30,000 to students from Highlands, Crosby, and Chinquapin. Scholarships are funded by Rotary activities during the year, primarily the Chili Feast and Raffle held in February. The event was hosted by club president Michelle Lomazoff, and the keynote speaker was the director of Chinquapin School, Dr. Ray Griffin. Chairman of the Scholarship event was Dr. Larry White, assisted by ten Rotarians on the review committee. Griffin thanked the Rotary club for their scholarship efforts, noting that many students do not finish college due to financial problems. He reviewed the history of Chinquapin, noting that over 80% of his graduates do complete college. Chinquapin was founded in 1969 as a private school for low income urban students. He said that students succeed through hard work, and having a personal relationship with a great teacher. Dr. White said that Rotary wants to invest in people in the community with these scholarships. There were 42 applicants, and 18 scholarships were awarded. This included 3 named scholarships at $2500, and 15 at $1500. He commented that all the applicants were outstanding, and it was a difficult job to choose only these 18. Dr. W. L. Doc Herndon Scholarship, presented by his daughter Patricia Herndon Scott, to Jaime Blair of Goose Creek Memorial High School. And to the following students currently in Universities: Amy Brewer, Merlanie Muldrow, Casey Parson, and Katie Stephens. In presenting the Bird scholarship, Weston Cotten noted that the recipient Cesar Larraga was class president, also president of the Rotary Interact Club, and an outstanding student. In presenting the McPhee Scholarship, Barbara McPhee noted that her husband Pat had a heart for giving and thought it was appropriate to continue this with the award to Sarah McKeon. 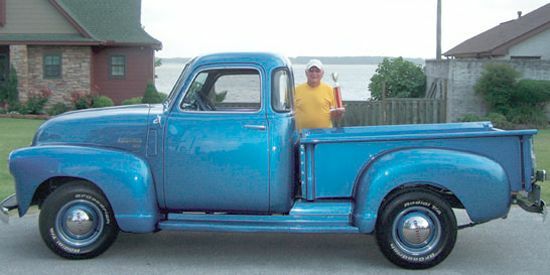 Patricia Scott said that her father, Doc Herndon, had wanted the Rotary Club to be a big little club as it is now known city-wide, and he and Chester Stasney came up with the idea of an auto raffle, which has allowed the club to make generous contributions to the community over the years. She said that Doc Herndon lived for Service Above Self the club motto. Bronze: Capital Bank, Hollico, Iris Inspection Services, Woodforest National Bank, Boaz Export Crating, United Community Credit Union, Southern Truck Sales, Safeway Signs.